App developers have had the tools to offer user-selectable app icons since March 2017 when the feature was introduced as part of iOS 10.3. At the time, only two apps officially supported the feature. One year later, the list isn't much larger, even though many of us would like to see widespread implementation of user-selectable app icons for the home screen. The problem seems to be that adding this feature to an app can be a real pain. Developers not only need to design or accumulate a suite of icons to offer their customers, they need to provide those icons at multiple sizes and resolutions to match a variety of devices. Developers are also not allowed to change the app's icon themselves, save for major software updates. These hassles might explain why most of the apps we see that offer alternative icons that users can pick and choose from aren't free or hide the feature behind "pro" accounts that cost money. It's a lot of effort to add user-selectable app icons, however desirable it may be. Many developers might simply not have the time nor resources to make it happen. Developers might also be discouraged from adding this customizability due to a history of rejections from App Store. Take a look at any forum or Reddit post about the subject — developers are more than frustrated with Apple for their apps being rejected for user-selectable app icons, especially those hidden behind a paywall. Nevertheless, there are apps that have made it through this rigorous process to allow their users to pick and choose what icon the app shows on the home screen. 3D Touch on the home screen. You'll find the option for most applicable apps in the in-app settings, however, if not, check the other two methods. As you can see below, MyLight's option is in the Settings app, while HQ's is tucked away in its home screen 3D Touch menu. 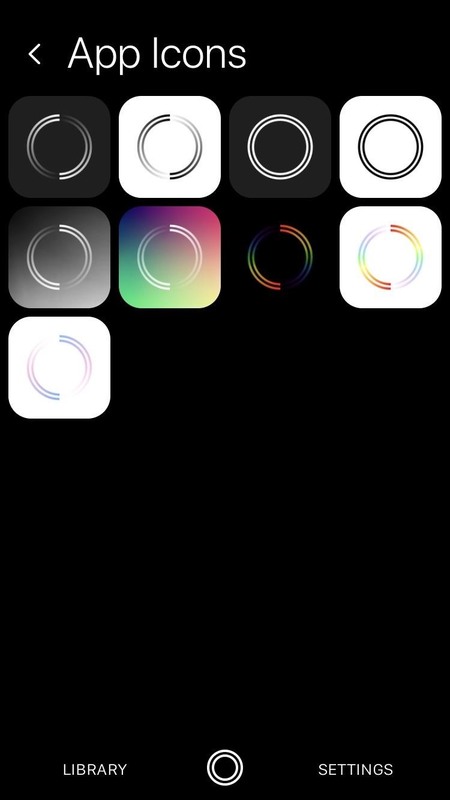 Cake's in-app settings (left); MyLight's iOS settings (middle); HQ's 3D Touch (right). This list is currently very short, but you can help! Let us know if we're missing any apps that offer user-selectable icons. We'd love your help in compiling the complete list of relevant apps we can. App icon options for Buffer (left), MLB At Bat (middle), and NHL (right). When we hear or see a new app that offers user-selectable app icons, we'll be sure to add it to the list above. So make sure to bookmark this page and keep checking back to see how you can add a little home screen customization to your iPhone without any jailbreaks or elaborate hacks.